JNN 18 July 2014 Gaza : Israeli troops backed by tanks and warplanes have pushed deeper into the besieged Gaza Strip, killing more Palestinians. Thousands of Israeli soldiers launched a ground invasion of Gaza on Thursday after days of air and sea-based strikes against Gaza. Israeli tanks have pounded different parts of the blockaded sliver on the 11th day of Tel Aviv’s aggression. Four family members were killed in Khan Yunis in southern Gaza, with another two murdered in the northern town Beit Hanoun, said emergency services spokesman Ashraf al-Qudra on Friday. Three men lost their lives in tank shelling east of Khan Yunis while another was killed in Shejaiyeh, east of Gaza City. Al-Qudra added that five people were killed by Israeli fire in separate assaults on the southern city of Rafah, including a five-month-old baby. 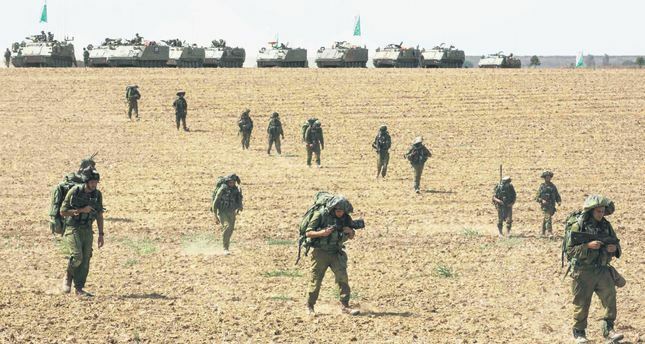 In northern Gaza, two men were killed in tank shelling in Beit Hanun. The spokesman added that, with the deaths of two men from another family in Khan Yunis, the Palestinian death toll in Gaza has reached 260. Palestinian health officials say 14 children under the age of 12 have been killed over the past two days in the Gaza Strip. Meanwhile, Israel announced its first casualty since the start of the ground operation in Gaza as a soldier was killed in the northern part of the sliver. According to the Israeli military, Israel had called up 48,000 reserve soldiers and, later on Thursday, its cabinet authorized the military to call up 18,000 more. The development came as Hamas chief Khaled Meshaal said on Friday that the Israeli ground operation was bound to fail. Israel began its latest onslaught against Palestinians in the Gaza Strip on July 8. About a third of the Palestinian fatalities are women and children . Palestinian medical officials said that more than 240 people have been killed, including many children and women, and more than 1,770 injured since July 8, when Israel started Operation Protective Edge in Gaza to end rockets fired by Hamas and other Palestinian groups. The last time Israel launched an extensive ground offensive in Gaza was back in January 2009, following an armed conflict that began the month prior in December. That offensive, known as Operation Cast Lead, began on January 3 and was tasked with a similar objective: to secure areas from which militants were launching rockets. The entire conflict – which ran from December 27, 2008 to January 18, 2009 –resulted in the deaths of up to 1,417 Palestinians and 13 Israelis. This entry was posted in Middle East and tagged Gaza, Gaza Strip, israel, israeli Invasion, Palestinian Authority. Bookmark the permalink.